Delmas House, at 124 Delmas Avenue, lies in a neighborhood that was the residential section for many of San Jose’s early professionals and shopkeepers, notably of its thriving music businesses, during the decades around the turn of the 20th century. The site originally held a small gingerbread Victorian much like those surviving across the street, but the current building is a landmark Craftsman bungalow constructed by Theo Brohaska, of the noted Brohaska music family. The adjoining lot at 142 was also part of San Jose’s music world as the home of one of the city’s first music store proprietors and his family, which developed connections with other contemporary music enterprises. 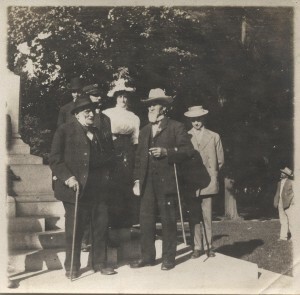 Gustave Brohaska, son of Otto von Prohaska, came to San Jose in 1851 with his wife, Margaret Otter, from the German town of Ober Katzou in Hesse-Kassel, Germany. He settled on 160 acres on White Road, but in 1861 he also took over the management of a hall on Santa Clara Street between 2nd and 3rd. During the Civil War he partly gave it over to the use of the local militia, and it became known as Armory Hall. In 1871 he converted it to theatrical and musical use and renamed it Brohaska’s Opera House. It flourished until it burned down on July 5, 1881. He rebuilt it, not without some trouble with city authorities and contractors, in the next year and continued to operate it for a few years. (It was later demolished, and the store block that replaced it in 1904 was styled “the Opera House Block”). History San Jose’s archives contain a group of snapshots of the family over the period 1890 to 1915, showing Gustave to be an elegant gentleman with equally attractive and stylish offspring. Gustave and Margaret had five children; three of them played a part in San Jose history for many years (Gustave, Jr., died in 1913, and Julius owned a liquor store across the street from the Opera House, but went to Mexico as a railroad engineer in 1904 and died on his ranch at Chula Vista in 1939). Theodore (Theo) was born in 1860 at River and San Fernando Streets, where Holy Family Catholic Church later stood. Matilda (Tillie) was born at First and San Carlos, later site of the Hale department store. Fred C., the youngest, was born in 1864 at the Opera House (where they apparently lived at the time), and made his debut as a violinist at age 5 on that stage. After the fire, the family moved around downtown for a few years, but finally settled at 124 Delmas Avenue between 1887 and 1888. Theo had started as a laborer with J. M. Dawson Packing Co. but soon became a carpenter, and served as construction foreman for the Robert Summers firm in San Jose for 24 years. Fred was a driver for the Wells Fargo firm, but after moving to Delmas Avenue had a fish market at Market and El Dorado (now Post Street) for a few years with partner Dennis Marander, who moved in with the Brohaska family from 1889-1891. The patriarch Gustave died in 1893, and in 1895 widow Margaret, Tillie and Fred moved out to 227 Orchard Street (now Almaden). After several trips to Europe, including studying in Leipzig for three years, Fred started a San Jose music studio in 1894 and formed an orchestra in 1897 which became a prominent feature of San Jose social life for the next two decades; he also worked as bookkeeper for the music firm of Scott and Brown at the southeast corner of 2nd and Santa Clara. 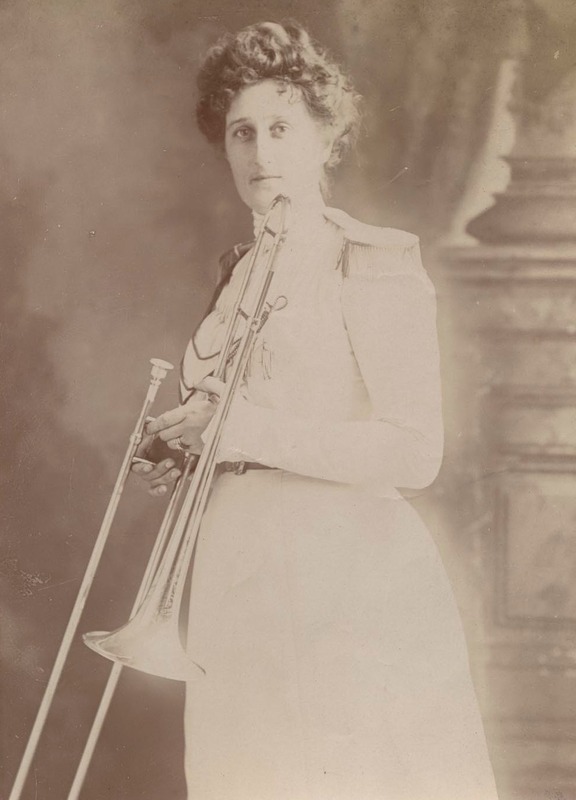 In 1901 he executed a brilliant publicity coup by forming the state’s first (and only) Ladies’ Brass Band, which played from a float in the parade celebrating President McKinley’s visit to San Jose in April. Sister Tillie played trombone in that band, and then joined with him in 1902 to open an expanded Music Studio at 221 Park (around the corner from the Delmas Avenue house of brother Theo); she was piano and vocal instructor. The studio and orchestra thrived, moving in 1918 to 199 Vine, where Fred also operated the Associated Oil service station. Shortly thereafter, Fred moved to Fresno, where he taught High School until he retired in 1926; he died on March 27, 1944. Fred was “fraternally active” as a charter member of the San Jose Parlor of the Native Sons of the Golden West fraternal order, member of the Odd Fellows, Maccabees, and also a charter member of the Local #153 of the Musicians Union (as was his sister). The redoubtable Tillie was also a prominent member of the San Jose scene. She was organizer and charter member of the Vendome Parlor of the Native Daughters of the Golden West, formed in 1897 at that venerable hotel on North First Street and ensconced there until the hotel’s destruction in the 1906 earthquake. She was the organization’s first Grand Organist for the state, and also served as organist for the Orders of Eastern Star and White Shrine, holding forth from a pillared arcade high in the upper wall of the old Scottish Rite Masonic Hall, now the San Jose Athletic Club on St. James Square. She played piano or organ for local groups and in local churches off and on for many years. 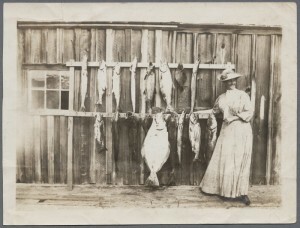 As a member of the California Pioneers, she bought the lumber for the replica Pioneer Log Cabin that was constructed in Alum Rock Park in 1916. She was also a noted sportswoman, and a 1915 photo shows her on the Santa Cruz wharf with a large catch that included a 33-pound halibut! Theo, who had married Elizabeth M. Gartleman on July 5, 1888, remained at the Delmas Avenue house with Gustave, Jr. Theo became prominent in local government, serving as City Councilman from 1910-1918 and on the Board of Freeholders for eight years. He was a charter member of Carpenters Union Local #399, and as contract foreman for the Summers firm helped to move Lincoln High School in one entire piece from one side of its property to the other, to make room for a new grammar school — this while classes remained in session! He had served as a flag boy for the local firemen in San Jose parades, and enjoyed playing trumpet in the 5th Regiment National Guard Band on many occasions. Local maps of 1901-1902 show that a major tributary of the Guadalupe River flows under Delmas Avenue just north of the property at 124, and it was undoubtedly covered several feet deep in the great flood of March 4, 1911, which was severe enough to necessitate boat travel on many downtown streets. Theo applied for a building permit to construct a new “cottage” on November 19, 1911, which was granted on December 1, and the construction was completed in very professional fashion. The new building is described in the City Survey of Historical Buildings (1977) as a fine example of Craftsman style with beveled siding and a partly half-timbered exterior. It had an unusually large side porch on the southern exposure, held up by three stone-trimmed pillars. Other special features were the horizontal windows at the entry and the multi-panelled front door. Interior panelling throughout the living and dining rooms, a great stone fireplace wall, built-in cupboards and pass-through from dining room to kitchen were undoubtedly supervised, if not actually constructed, by Theo (and perhaps by Gustave before his death a year later). In 1915, Theo’s daughter Catherine Margaret became a teacher at the San Jose High School, and in 1919 Theo sold the house to Henry C. Vincent, a clerk for the U.S. Railway Administration. Vincent, in turn, sold the property to Peter N. Dalis around 1921-1922. (The house number is incorrectly listed in the San Jose City Directory of 1922 as #121; by 1923 the correct number is restored). Later, Irene Dalis, Opera San Jose’s founder and director, gave the house, her childhood home, to the opera company to house its artists-in-residence. The house is now a registered city landmark in San Jose.